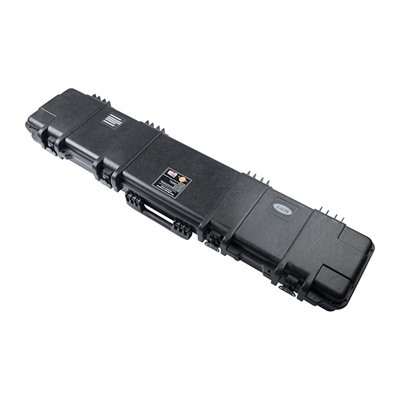 Boyt Tactical's H-Series line of hard-side cases are designed and engineered to meet or exceed law enforcement, military and airline standards. Tough H-Series cases are made in the U.S. using a high-impact, custom-formulated resin and sold with a lifetime warranty. H-Series Features: Made in the USA Injection Molded All steel powder coated draw latches Field replaceable latches Dust proof O-ring seal Pressure relief valve Egg Shell Foam Interior Purpose built for firearm use Fully stackable Padlock compatible Collapsible, comfort grip handle Mfg: Boyt Harness SPECS: Interior Dimensions: 48" x 9" x 4", External Dimensions: 50" x 12.5" x 5", Interior Dimensions 11" x 8" x 5.25", Exterior Dimensions 13" x 11" x 6"